When Liberty, MO business, Metals USA—a provider of metal processing and inventory management services, was tired of pouring money into unnecessary labor and production systems, they called IBT. They were having trouble with their bearings being lubricated correctly. For about an hour, once every eight-hour shift, Metals USA relied on one worker and their grease gun to manually hit all 106 of the lubrication points in their hydraulic system. Although tedious and time-consuming, their business relied on the accuracy of this job; missing even one would cause machine malfunction and, as a result, downtime. That’s when Metals USA called on IBT Fluid Power Specialist, David Leffert, to go in, inspect the system and find out more information. Once he had a better understanding of what needed to be lubricated, he could then determine how much lubrication the system required for optimum efficiency. With a little creativity and a lot of math, Leffert then sat down to design the entire system, which took him about 20 hours. His first step involved researching each of the 106 bearings and their manufacturer’s lubrication requirements, which he then used to make the necessary calculations: “There is a ratio of available grease from the pump to each lubrication point that I had to calculate in order to configure the valve manifolds and make it all work,” he said. From there, IBT’s team of experts came together to put these designs into action: “We built all the valves in our shop and assembled all of the G3 Graco pumps. We also supplied them with all of the hose, connectors and adapters,” Leffert said. Metals USA’s was able to install the two-cartridge system after they received all the components from IBT. Leffert was on site to ensure a successful startup, which went “flawlessly,” he said. 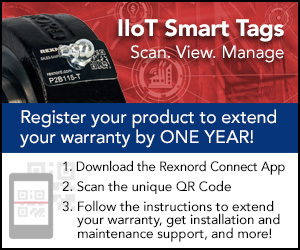 The self-lubricating system is not only more effective, but self-monitoring, as well: “If it malfunctions and fails to lubricate every point, or if the system runs out of lubricant,” Leffert said, “it sets off an alarm.” With an automatic lubrication system, you can count on consistency and accuracy. 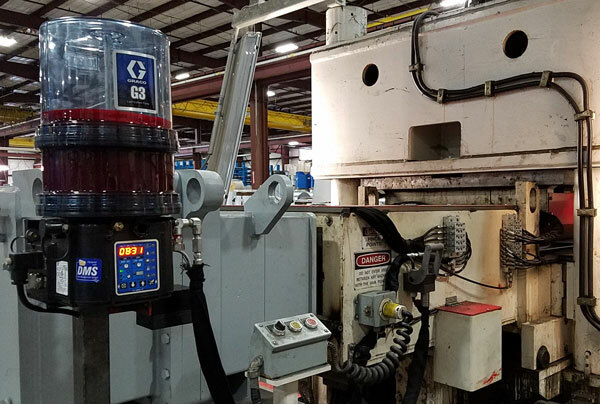 According to Metals USA Maintenance Manager, Jerry Washam, “while it’s running, the machine is now being greased more to the aspect of what it should be. When time is money, efficiency makes all the difference. “Rather than having two pumps, they put in one with a disconnector to easily connect and disconnect,” said Washam, making it quicker and easier to lock it down, change out the cartridges and get it up and running again. 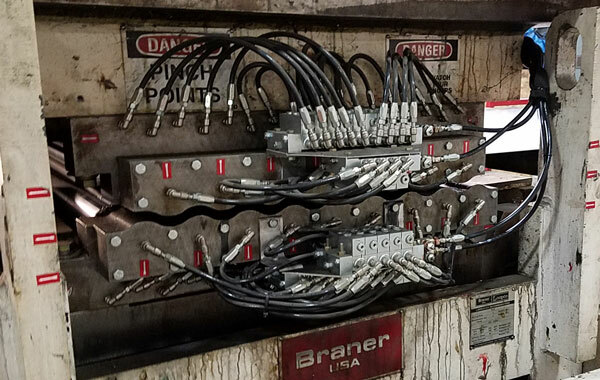 Leffert said he designed the automatic lubrication system so that when the cartridges do require replacement, all of the Graco MSP Series lubrication blocks can be replaced, as well. With a streamlined, self-regulated system, routine maintenance and downtime are almost eliminated completely. Extended Machine Life: ”It will increase the longevity of the machine because it’s no longer being abused as much,” Washam said. Cost Savings: “The cost savings is one person’s labor per week and the eliminated downtime of the machine. The customer said it would probably pay for itself in less than a year, plus they gained that production time back, as well,” Leffert said. Could a Graco Automatic Lubrication System Help You? Metals USA sells approximately 1,000,000 tons of metal products annually (including processed carbon steel, stainless steel and aluminum) to thousands of customers in the United States, Mexico and Canada. In addition to warehousing and distribution services, they offer a wide range of value-added metal processing services including: cutting, sawing, punching, shot blasting, surface grinding and drilling. Visit them at www.metalsusa.com. If you want to increase the efficiency of your hydraulic systems, Contact IBT today.